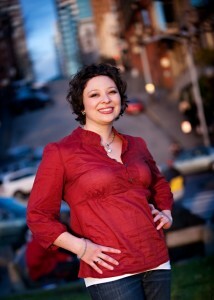 My name is Jayme and I am a green Mama and the creator behind Handmade by Jayme. My journal represents my thoughts about living a sustainable and healthy lifestyle, which should be second nature to me, but sometimes isn’t. My website represents, well, me. I started blogging a few years ago as a way to interact with the sustainable construction community; it morphed into an outlet to express my opinions on the sustainable movement as a whole and how one person can live within it. I enjoy my studio – where I create quilts (both large and small), baby items, Christmas ornaments(! ), and more – and my kitchen where I create healthy and organic body products. I am always keeping an eye out for DIY handmade and homemade projects, ways to inspire others, articles of interest and activities to keep my kids entertained. I would like to bring you along for a sustainable journey, where you will meet my amazingly supportive husband and two young children. I hope that by sharing my experiences, I may inspire you along the way. Second Nature | Copyright © 2015. All Rights Reserved.